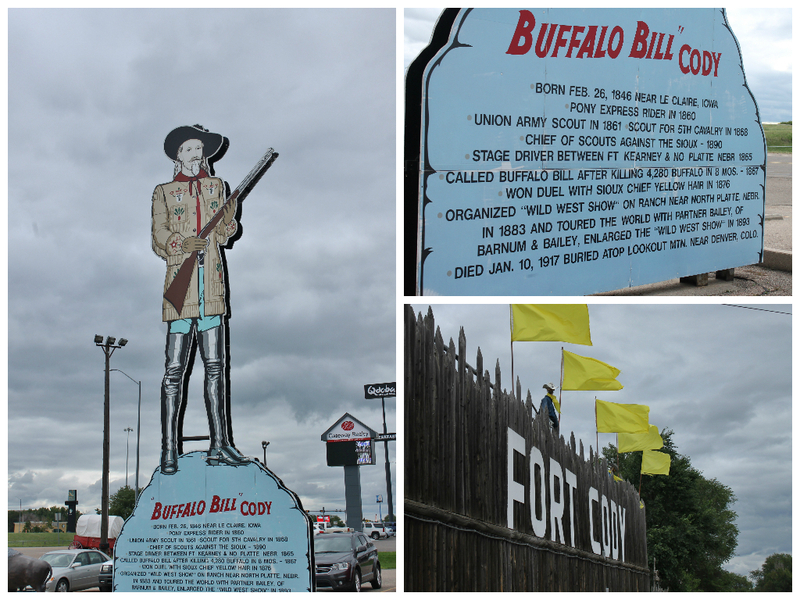 Our third stop in Nebraska was a quick two days in North Platte, we arrived there on August 17th. We stayed at the Holiday RV Park, it is also right on I-80 so again we had traffic noise. It seems a number of Good Sam campgrounds are on the expressway. It is a nice campground, again the sites are not very wide, once the slides were out there wasn't much room in between campers. The grounds were fairly well maintained and they have a well stocked camp store. Nancy forgot to take a picture of our site, but did get one of their pool that is shaped like Nebraska! There is a road just down from the campgrounds that dead-ends at the North Platte River. There are no houses on it, so it was perfect for walking the dog and letting her run. Nancy discovered a pretty little waterfall at the end of it and enjoyed the morning sunshine. 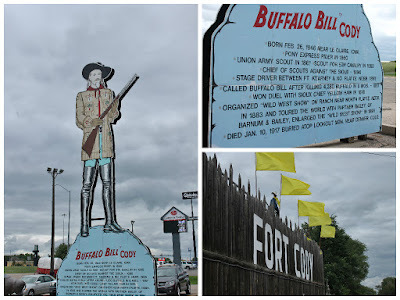 On the same road as the campground is the Fort Cody Trading Post. It is a large store with every tourist type item you can think of, of course we walked out of there with a few trinkets! Behind the store is set up like a small village with a very large Indian in the center of it. In all honesty it is the worst Indian we have seen. We explored North Platte a bit, we went to the Golden Spike Tower, which houses historical information about the railroad. The building sits on the edge of the railroad yard, and they have an observation tower that allows you to see down the tracks. It would have cost us $16.00 for the two of us to go up so we chose not to. They do have a nice gift shop and they are converting three train cars into a restaurant that is expected to be done next year. North Platte is also where you will find Scout's Rest. A beautiful home built for Buffalo Bill (William Frederick Cody), as a place to relax between shows. There seems to be some sort of obligation to visit at least one Pony Express historical site while traveling. We went to Gothenburg, NE to see the one there. The docent who was working that day was very nice and extremely informative. He has quite the passion for history. We actually learned a few things about the Pony Express that we didn't know. This particular building was on a farm a number of miles away and when the lady who owned the farm was selling she donated the building to Gothenburg so it could be preserved for history. The American Legion raised the money to move the building to this location. It is one of only a few buildings left on the trail - most spots are an historical sign with the Pony Express medallion on it. 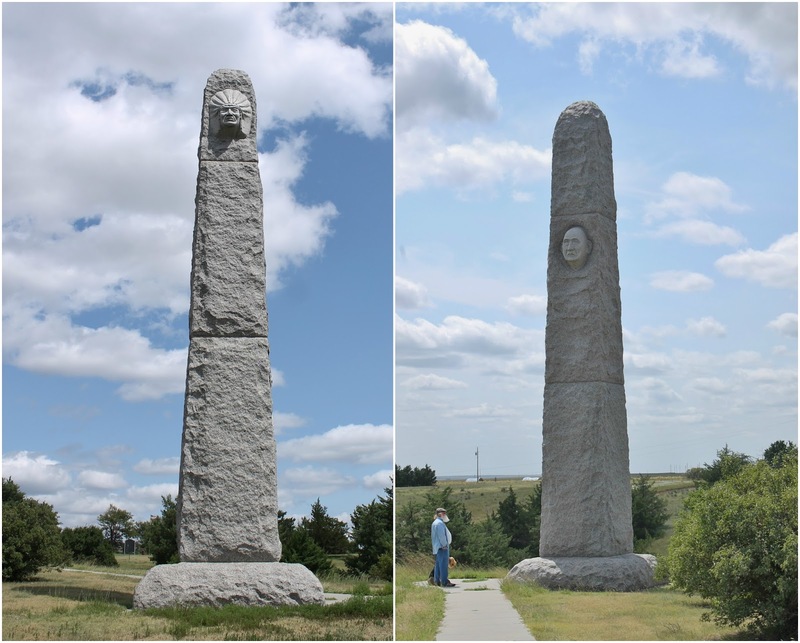 We visited the Massacre Canyon Monument in Trenton, NE. The Massacre Canyon Battle took place on August 5, 1873, about a half mile west of this spot. 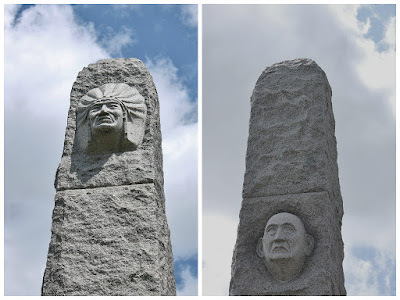 It was one of the last battles between the Pawnee and the Sioux and the last large-scale battle between Native American tribes in the area of the present-day U.S. A Sioux war party of over 1000 warriors attacked a party of about 700 Pawnee on their summer buffalo hunt. The Pawnee retreated into the head of the canyon with the Sioux in pursuit. A U.S. Cavalry unit stopped the Sioux attack, but not before many lives were lost. The defeat so broke the spirit of the Pawnee they moved their reservation to Oklahoma. The monument has the face of each tribal chief on it. us of "He who should not be named"
There is a small visitors center on the site, the guy working there seemed so glad to have someone to talk to. Along with the historical information there is a gift shop that has work from local artists. When he found out we were full time RVer's he had a ton of questions for us. While attempting to use the restroom - Nancy encountered quite the surprise. A dead mouse! Not a great day for either the mouse or Nancy. Another odd thing on this trip, we passed a place called Hill Perks Coffee Shop, so with Nancy still in need of a bathroom and us always wanting coffee we stopped. When we entered there were three tables of women playing cards. No counter to order coffee from, so we sat at a table and watched the four women in the kitchen cook and bake, while pointing out to us yet not coming out to see if we wanted anything. We were just about to leave, after 8 minutes of this when the owner came out of a back room. She seemed surprised we wanted just coffee - remember the sign said "coffee shop" and disappeared into the kitchen. She finally brought us our coffee in to-go cups like we asked and then just walked away with out telling us how much we owed! We finally were able to pay and on the plus side the coffee was actually good but a strange little place. A real bonus was, no dead mouse in their toilet. A happy side note - One of our neighbors saw our Finnish flag and came over to see who the Finn was. Kari and Marjo were both born in Finland and have been in the U.S. for 43 years, they still both have a bit of an accent, which was great. He was so disappointed when Nancy didn't speak Finnish, she actually felt bad that she didn't. Didn't get to spend as much time with them as we would have liked but exchanged emails and have already communicated that way. One of the best things about this traveling is the people we meet. Some it is just a passing acquaintance and we both move on after sharing stories, others we have continued to keep in touch with. ~ As annoying as customer savings cards can be - it is a great way to save some money. When you are traveling on a fixed income every penny helps. Gas cards, grocery cards, and memberships all help the bottom line. We are getting quite the collection as we encounter different gas stations and grocery stores as we go. We are members of Good Sam and Passport America, both give discounts for camping, Good Sam 10% and Passport 50% for one night to the whole length of stay depending on the campground. With Good Sam you also get a discount at Camping World and Pilot Gas Stations. Our membership to the Western North Carolina Nature Center, gets us discounts at a number of zoos. Every little bit helps.